To play this event, you must command three Bajoran Resistance personnel. 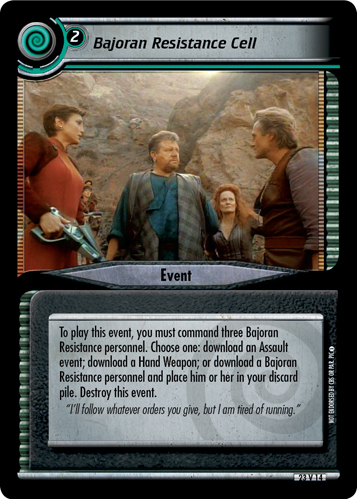 Choose one: download an Assault event; download a Hand Weapon; or download a Bajoran Resistance personnel and place him or her in your discard pile. Destroy this event. "I'll follow whatever orders you give, but I am tired of running." Characteristics: "use" your discard pile, download, download - Assault (cards), download - equipment. Requires: Assault, Hand Weapon, Bajoran Resistance.